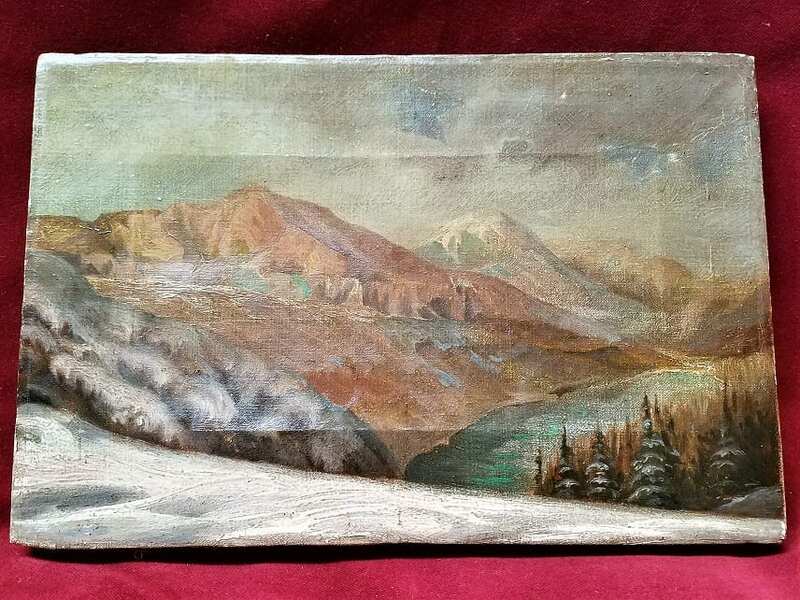 Early 20C Oil on Canvas of St Marys Valley Glacier National Park Montana by Thorvald Strom. 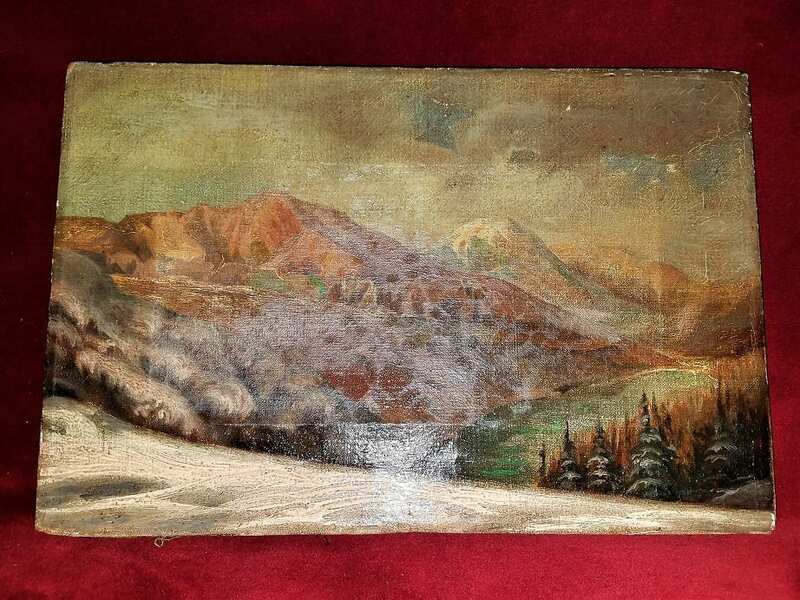 PRESENTING a nice Early 20C Oil on Canvas of St Marys Valley Glacier National Park Montana by Thorvald Strom. Thorvald Strom was a Danish artist, sculptor and furniture maker originally from Denmark but who emigrated to Harrison Hot Springs in British Columbia at the turn of the 20th Century. 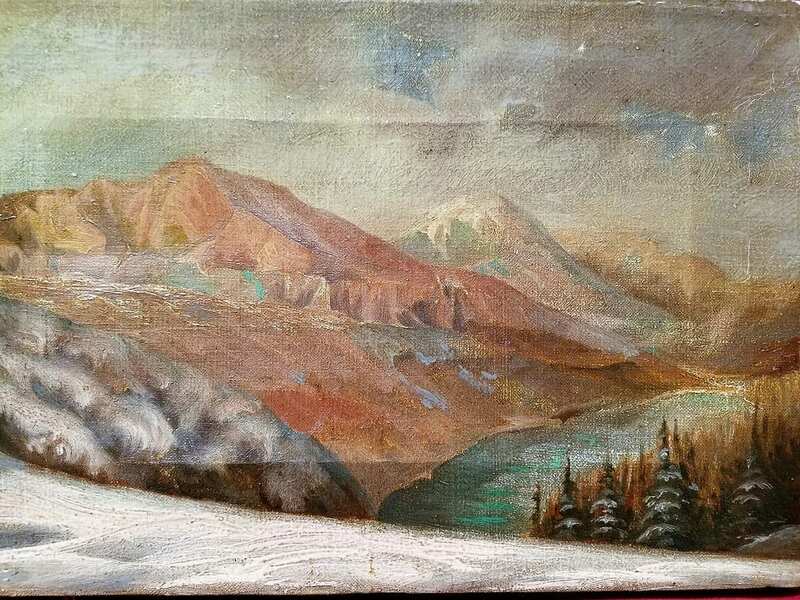 He had a studio in Harrison Hot Springs and continued to produce unique and one of a kind pieces up until the 1950’s. We have framed photos of both he and his family outside the Studio in the 1940’s/50’s. 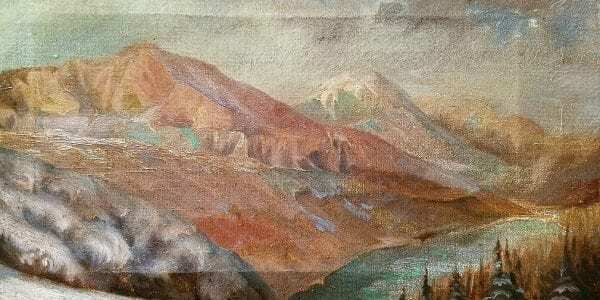 He became very prominent and his pieces are VERY HIGHLY regarded and treasured in B.C. and Montana. This unframed oil on canvas is of St Mary’s Valley in Glacier National Park in Montana. 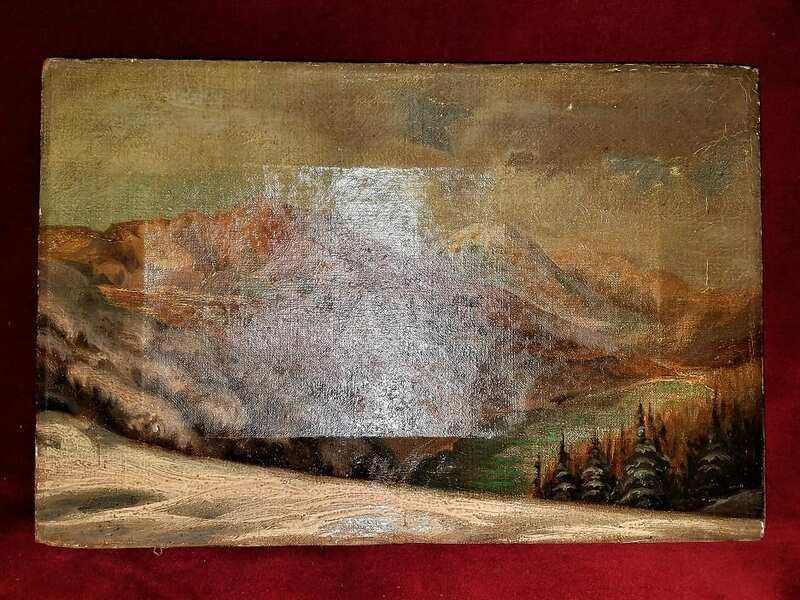 It depicts the glacier with mountains and a river. 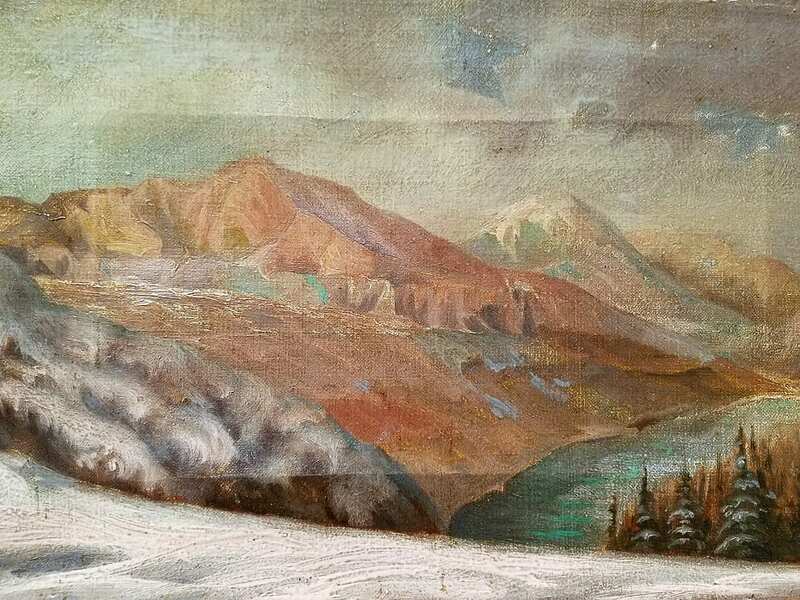 Painted in or around 1910-15….it is unsigned but MOST DEFINITELY by Thorvald Strom. 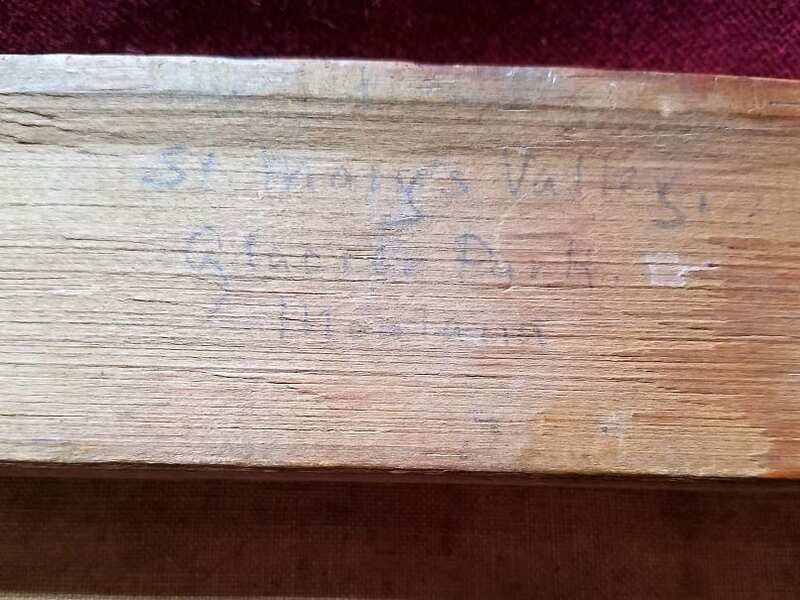 It is hand written on the frame that it is a painting of St. Mary’s Valley…..in T. Strom’s hand. 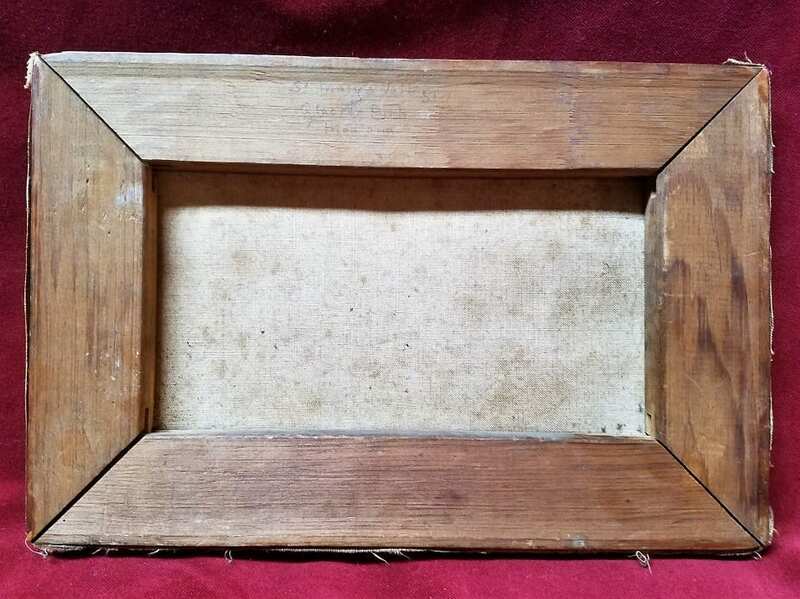 HIGHLY COLLECTIBLE and DECORATIVE PIECES.....UNIQUE!! The Village of Harrison Hot Springs is a small community at the southern end of Harrison Lake in the Fraser Valley of British Columbia. It is a member of the Fraser Valley Regional District; its immediate neighbour is the District of Kent and included in it, the town of Agassiz. It is a resort community known for its hot springs, and has a population of just over 1500 people. It is named after Benjamin Harrison, a former deputy governor for the Hudson's Bay Company. The Village of Harrison Hot Springs has been a small resort community since 1886, when the opening of the Canadian Pacific Railway brought the lakeside springs within a short carriage ride of the transcontinental mainline. In its first promotion as a resort it was known as St. Alice's Well, although it had been discovered decades earlier when a party of goldfield-bound travellers on Harrison Lake capsized into what they thought was their doom, only to discover the lake at that spot was not freezing, but warm. Although the resort flourished in a low-key fashion for years after this discovery was exploited by hoteliers, the Village of Harrison Hot Springs was not incorporated until 1949. Its namesake hot springs are a major attraction for tourists who come to stay at the village's spa-resort. The hot springs themselves were originally used and revered by the Sts'Ailes (Chehalis) First Nations people who live along the Harrison River nearby. There are two hot springs, the "Potash", with a temperature of 40 °C, and the "Sulphur", with a temperature of 65 °C. According to Harrison Hot Springs Resort, the waters average 1300 ppm of dissolved mineral solids, one of the highest concentrations of any mineral spring. This hot spring is one of several lining the valley of the Lillooet River and Harrison Lake. The northernmost of the Lillooet River hot springs is at Meager Creek, north of Whistler, with another well-known one to the east of Whistler at Skookumchuck Hot Springs, midway between Pemberton and Port Douglas. One feature of this chain of hot springs is that the Harrison Hot Springs vent is the most sulfuric, and there is consistently less sulfur content as one goes northwards, with the springs at Meager Creek having almost no scent at all. Saint Mary Lake is the second-largest lake in Glacier National Park, in the U.S. state of Montana. Located on the east side of the park, the Going-to-the-Sun Road parallels the lake along its north shore. At an altitude of 4,484 feet (1,367 m), Saint Mary Lake's waters are colder and lie almost 1,500 feet (460 m) higher in altitude than Lake McDonald, the largest lake in the park, which is located on the west side of the Continental Divide. Here, the great plains end and the Rocky Mountains begin in an abrupt 5,000-foot (1,500 m) altitude change, with Little Chief Mountain posing a formidable southern flank above the west end of the lake. The lake is 9.9 miles (15.9 km) long and 300 feet (91 m) deep with a surface area of 3,923 acres (15.88 km2). The waters of the lake rarely rise above 50 °F (10 °C) and are home to various species of trout. During the winter, the lake is often completely frozen over with ice up to 4 feet (1.2 m) thick. The opening scene in the 1980 Stanley Kubrick film The Shining was shot at Saint Mary Lake. Provenance: From the Lida Calvert Hall/Obenchain/McMillan/Godwin Collection. Dimensions: " Tall with a diameter of " at its widest. Condition: Pretty good for its age...could do with a professional cleaning.